By Terry Frei The Tribune of Greeley, Co.
Lee Maxwell stands with his wife, Barbara, in the warehouse where Lee shows off some of the washing machines in Eaton on Aug. 2. The retired Colorado State University electrical engineering professor displays roughly 1,500 washing machines. 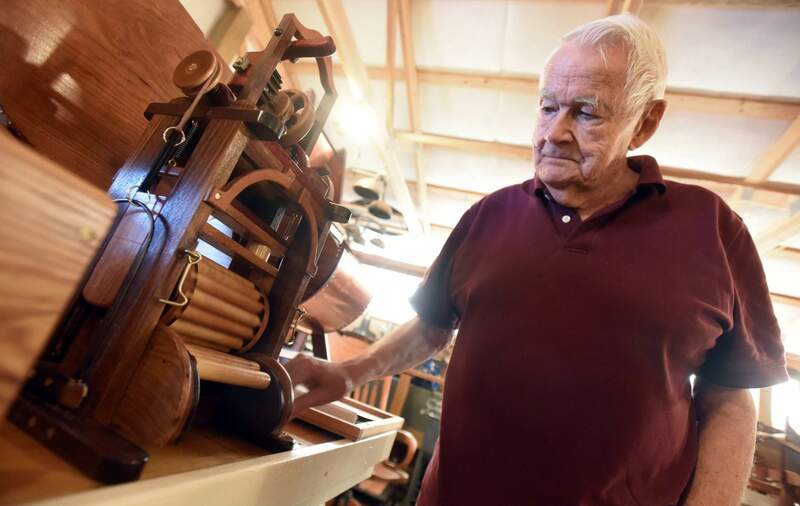 Wheels and wooden gears crank as Lee Maxwell demonstrates one of the washing machines at the Washing Machine Museum in Eaton on Aug. 2. 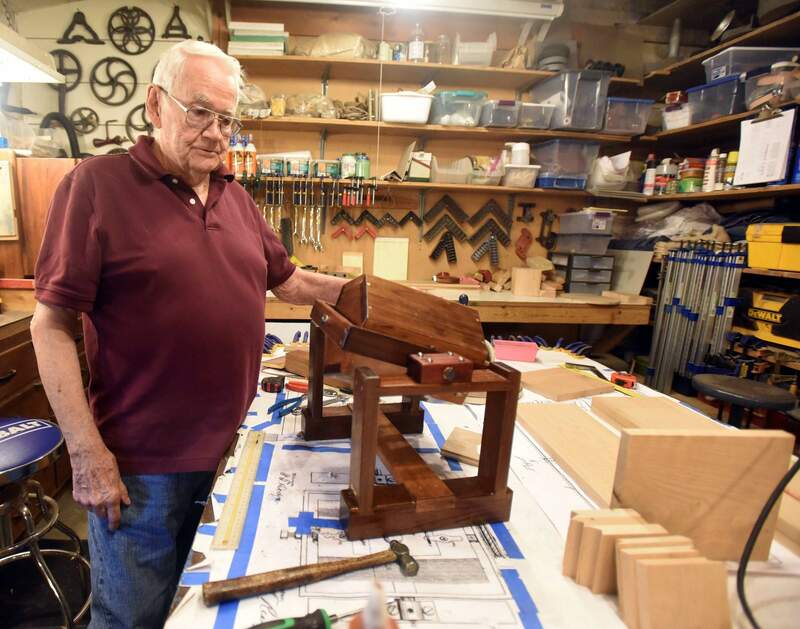 Lee Maxwell tests out one of the wooden washing machines in his workshop that is still being assembled at the Washing Machine Museum in Eaton on Aug. 2. 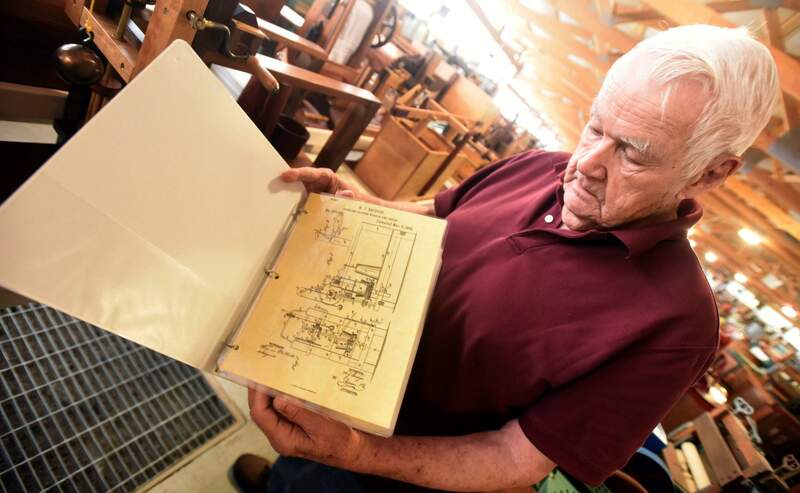 Lee Maxwell shows off one of the schematics he used to rebuild one of the older washing machines at the Washing Machine Museum in Eaton on Aug. 2. Maxwell has built many of the wooden washing machines based off of schematics. Lee Maxwell stands in the middle of his warehouse among some of the 1,500 washing machines he has on display at the Washing Machine Museum in Eaton on Aug. 2. Maxwell has restored many of the machines and often sets up tours to share some of the history of the washing machine. GREELEY – One of my pet peeves is how we so casually use the term “unbelievable!” as the catch-all for such amazing accomplishments as an NBA shooting guard draining an 18-foot fall-away jumper with a hand in the face. To me, “unbelievable” always would have been more along the lines of the long-lost Amelia Earhart reappearing at age 121 and landing her ancient, sputtering plane on Greeley’s 8th Avenue. After visiting the Lee Maxwell Washing Machine Museum in Eaton, I’m changing my definition. The museum is mouth-dropping. Eye-widening. Stunning. Unfathomable. You have to see it, perhaps on the tours Maxwell offers by appointment only, and even then it’s, well, unbelievable. It must be an illusion. Surely, these all can’t be washing machines, all different, going back to the 19th century, including one with a wood treadmill attached to the machine so a goat (allegedly) can run on it and provide the power. Or another with kids on a teeter-totter-type mechanism powering the washer. Indeed, they’re not all washing machines, since Maxwell also dabbles in such things as a few dryers and irons, tucked away in corners. But washing machines dominate. The retired Colorado State University electrical engineering professor, now 88, displays roughly 1,500 washing machines, farther than the eye initially can see because they are squeezed into two warehouse-type buildings adjacent to the Eaton home where he and his wife, Barbara, have lived since 1974. 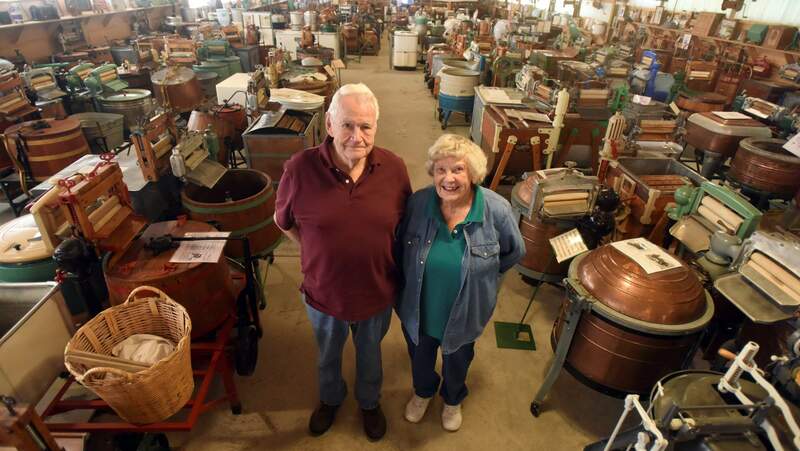 They also were part-owners of the adjacent family business, the Eaton Grove nursery, for many years, but now their daughter and son-in-law, Judy and Ken Olsen, are the sole owners. By the way, that total of 1,500 washing machines is off the record. That initial impression probably doesn’t do justice to Maxwell’s museum. 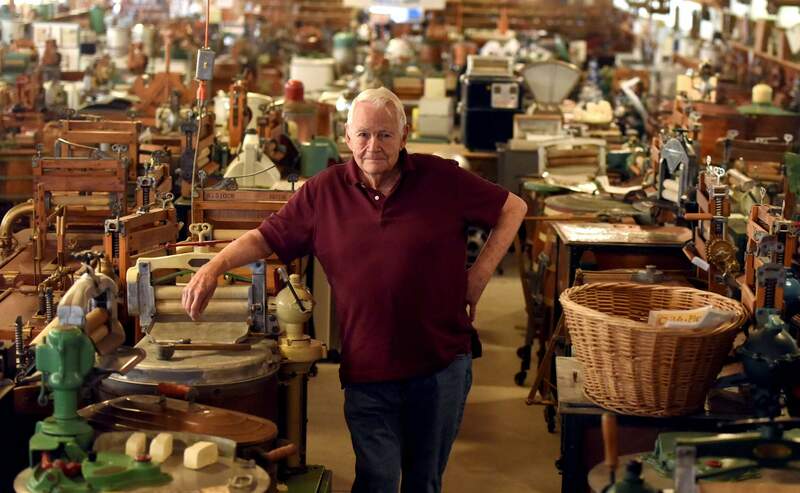 He didn’t just round up all these machines, many of the older ones with wood frames or bases, but he also had to tear apart, clean and reassemble roughly 90 percent of them before putting them on display. Plus, with his collection about “maxed out,” he has downloaded 23,000 washing machine patents to his computer, and for the past two years, his alternative passion has been to meticulously build scale models – what he calls “patent demos” – of older machines he has no hope of finding, whether because they never were made or because there’s no way intact wooden machines still could be out there. One of those patented designs he has built to scale is a combination kitchen table, bathtub and washing machine. He also stepped up his pursuit of washing machine instruction manuals, advertisements and other printed materials. When he retired in 1985, Maxwell had been at the University of Idaho for seven years and CSU for 23. His first antique washing machine was a gift from Barbara’s aunt, an old hand-operated Rue model given to the aunt by a nearby Nebraska farmer in 1920. “I had no inclination to collect washing machines,” Lee said. That machine now has an honored spot near the entrance to the first building in the museum, and it also has the No 1 inventory number in Lee’s online catalog. Many more followed, starting after Lee and Barbara set out for Maine in their motor home to celebrate Lee’s retirement. Lee was hooked. Why washing machines? After that initial excursion, the Maxwells planned out ensuing trips by placing pins in a wall map, showing where they had been told machines they wanted were available. “I left my card everywhere,” Lee said. They took month-long trips two or three times a year, using back highways and hitting every flea market, antique shop or farm sale they encountered. They’d pick up those “pinned” machines, but Lee also said he bought one a day from other sources on the road. The towed trailer ended up crammed and stacked with machines. Lee had a checklist of models he needed to fill out his collection and bought duplicates occasionally to use in trades. The two warehouses went up next to the house two years apart, around 2000. The Maxwells stopped making the motor home buying trips about 10 years ago. The collection was just about complete, with nearly all of what Maxwell believed might be available. Groups visiting Maxwell can be from senior-citizen groups, car clubs, churches and other places, and television crews have come from Japan and Russia, plus from “Antique Road Show” and a terrific, if tantalizingly brief, segment of the CBS Evening News’ “On the Road with Steve Hartman.” Maxwell is a legend in a niche world, around the world on the internet. “I’m that old, insane guy who collects washing machines,” he said. So what’s he going to do with this collection? He said he really didn’t know. It’s too big for my garage.